Following the organization of Cabarrus Genealogy Society in June 1993, Tim Auten and Kathryn Bridges put together and published our first journal. It was appropriately called The Cabarrus Genealogy Society Journal. Since then, we have published a quarterly record of what the society is doing now and what local folk were doing way back when. 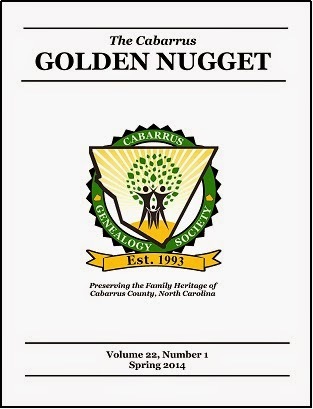 After Fran Tallent became editor, the name was changed to The Cabarrus Golden Nugget to reflect the long history of gold mining in the county. Journals are mailed quarterly to all Cabarrus Genealogy Society members, but future plans are to additionally make it available in the Members Only section. We will post information about various features and content as changes are made. Journal back issues are available starting with Fall 1993 at $5.00 each, including shipping and handling. We have sold out of some of the early issues. We are willing to exchange journals and publications with other genealogical/historical societies. Historic Cabarrus Association and the Cabarrus Genealogy Society are always interested to receive submissions related to Cabarrus history or genealogy for publication. Contact Ashley Sedlak-Propst at historiccabarrus@gmail.com or e-mail to: cabarrusgenealogysociety@gmail.com.